The artist playing the theme from 'Midsomer Murders' is Celia Sheen. That's very cool....She's a good player, too...I don't know about Tony Henk or his theremins...I've never seen one with the long pitch and volume antennae. It sounds pretty good in this video..
Hi Mollydad,I don't know if Mr Henk (Britain based)still makes theremins..I think they sold for about 3000 dollars back in the late 1990's...a professional instrument... below is Lydia Kavina playing another Henk theremin which looks quite cool to.I believe she played this theremin from 1995 to about 2000. I've been told that M Henk, a brilliant British engineer stopped developing theremins after he discovered that all the time and resources he invested would never pay back and it seems that he was very frustrated about that. (I fully understand him, but I'm not yet at this point of resignation). He is retired now and he doesn't want to hear or to talk about theremins. It seems that he gave all documents (schematics, notes etc.) to one of his students who never cared about that, thus we have to consider that this heritage is lost. A certain French "thérémingénieur" is constantly trying to gather information snippets together in order to be able one day to understand all the specifics of Henk's unique circuit design. - Henk theremins are not perfectly but very linear, and this without the "classic" linearization coils. He combined a very thin and long pitch antenna with a very unusual L/C ratio in a Clapp oscillator in order to achieve that. - His instruments needed often to be retuned during playing, since the long pitch antenna made them more sensitive to changes in the environment. Out of that, there were temperature drift problems: in conventional theremins there are identical circuits for the fixed and variable oscillators in order to eliminate such effects. Henk used a very stable XTAL CMOS oscillator running at ~145kHz as a fixed pitch oscillator instead, so that the drift of the variable oscillator affected permanently the size of the pitch field. - The 145kHz signal from the fixed pitch oscillator was reused through a frequency doubler stage to drive an amplitude discriminator at 290kHz to which the volume loop was connected in order to obtain the volume CV for the VCA. 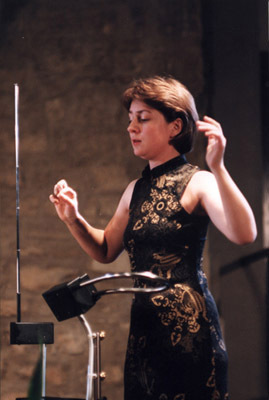 I played Lydia's Henk theremin back in 1997 and was unimpressed with it. I believe that if you could get your hands on it and study it, you could improve it enormously. I also believe that as the spiritual son of Lev Sergeievitch, if you wished to, you could design and build a theremin that would be superior to anything Tony Henk or Bob Moog ever made (with the possible exception of the Ethervox). The theremin is not an instrument with a happy history. Those who have gone into the business of building them have often met with disappointment but they seem to have had no choice in the matter. The theremin appears to have chosen them, rather than the opposite. Thank you for the confidence! Actually a citation from G.E.Lessing's Emilia Galotti is ruling my life: "The art follows the bread". 1...Would be operated from a stable 5 volt supply from a 9 volt battery. 2...Would have glass plate capacitors (in the radio fixed and variable oscillators)as they are quite stable and drift very little.Capacitors up to 100 pF are not very hard to make ie easier than winding coils for example. 3...Since the capaitors are fixed glass ones the coils (only two coils in my ideal theremin) would have to be adjustable easily available ones. 4..The volume antenna and circuitry would be replaced by an infrared system operating at a fixed ultrasonic frequency so as to not be affected by ambient light so could be used in the same way as the traditional volume antenna. 5...The initial tone or 'voice' of the theremin should be as close as possible to a sine wave.This is of course not very interesting musically so subsequent wave shaping circuitry between the line out of the theremin and the amp should be used to shape the sine wave to what ever 'voice' is desired. 6...The infrared volume setup could be operated on a 5 volt supply from a 9 volt battery and so could the wave shaping circuit as well as the radio frequency part ie the heart of the theremin.So therefore one would use 3 nine volt batteries so everything would be done at low power and not need a plug in power adaptor.And maybe even the amp would be battery operated ie a car battery one like they have in cars. 7..Of course the pitch playing field would be as linear as possible.I have done some experiments with cylindrical antennas of various proportions on Art Harrison's minimum theremin which has no coils and got close to a linear field...a cylinder can be thought of as a coil of wire infinitely long and infinitely thin.A cylinder can behave like a very long coil but only at certain proportions and areas in relation to the initial radio frequencies of the theremin' heart.Therefore my ideal theremin may have a cylindrical antenna. 8..four or five octaves is plenty.